Use SureSwatch color swatches to make sure that you’re always choosing the exact right color for your home! You have looked and evaluated color after color to find the right color for your home. 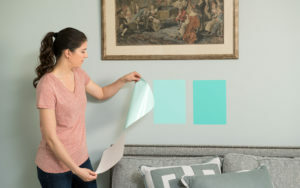 The final step is to try that color on in your home. You know that the only way to get it right is to see the actual paint color with your furnishings and in your lighting. SureSwatch makes it easy for you to get it right. Just paint a SureSwatch, place it on the wall, and remove. The low-tack adhesive makes it easy to remove, leaving a clean wall and no hassles of prepping.